The car that greeted visitors at the Concours d'Elegance Festivals of Speed 2013 in Vinoy Park St. Petersburg Florida - Nikon D300 Tamron 17-50mm @ f/8 ISO 200 7-exposure HDROn a very sunny day in Vinoy Park in downtown St. Petersburg Florida I strolled into the Concours d'Elegance Festivals of Speed 2013 with a media pass and my Nikon. I spent as much time talking to people there about cars and their car related products and services as I did making photographs. I already posted images of an orange Lamborghini and a chrome Nissan GT-R. The photos below are a few car details that caught my eye. 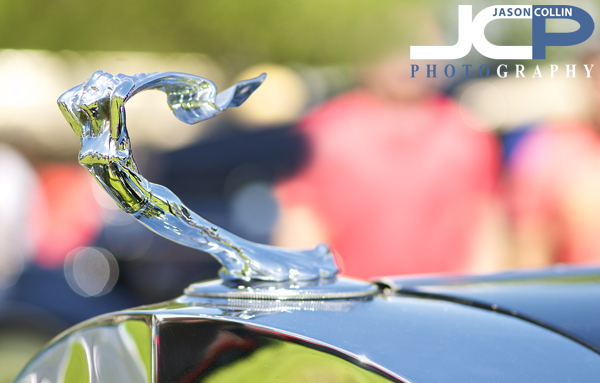 1930 Cadillac hood ornament emblem at Festivals of Speed 2013 Florida - Nikon D300 Nikkor 105mm VR micro @ f/4 ISO 200 1/800thI first thought this was a Rolls Royce hood emblem and had to do some research to identify it since I never made any other photos of the car. I found out it was actually a 1930 Cadillac. Porsche Cayman bokeh look at Festivals of Speed - Nikon D300 Nikkor 105mm VR micro @ f/4 ISO 200 1/800thI like the lines of the Porsche Cayman very much. I used a large aperture to show only the front fender in focus letting everything toward the back of the car start to disappear. The Maserati logo on a Gran Turismo at Festivals of Speed Vinoy Park Florida 2013 - Nikon D300 Nikkor 105mm VR micro @ f/4 ISO 200 1/1250The distinctive Maserati logo found on the side of a silver Gran Turismo at the Festivals of Speed. Using a 105mm prime lens forced me to look for details as getting an entire car into the frame in a crowded car show was impossible.